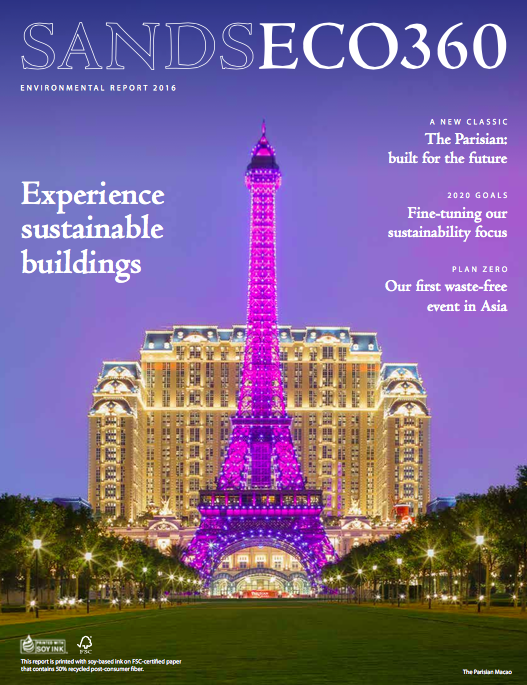 Sands ECO360, the global corporate sustainability program of Las Vegas Sands (NYSE: LVS) has released its 2016 environmental report. The report marks the company’s first annual measurement against its revised sustainability goals, building upon the success and key learnings of original targets set in 2011 and reported on through 2015. LVS has continued to earn extensive recognition for achievements from external stakeholders, such as its inclusion in the Dow Jones Sustainability Indices (DJSI) North America, and earning a position on CDP’s Climate A List. Other awards LVS earned in 2016 include Macao Green Hotel Gold Award for Sands Cotai Central in Macao, LEED Gold® for Building Operations and Maintenance recertification for the Sands Expo and the Congress Center at The Venetian and The Palazzo Las Vegas, and The Pacific Asia Travel Association (PATA)’s Grand Award for Environment for Marina Bay Sands in Singapore. To obtain additional information and to download the 2016 Sands ECO360 Environmental Report in its entirety HERE.